With a cork-like trunk and fine, needle like leaves that change colour in winter, Allocasuarina torulosa or Rose She-oak is a medium to large sized tree. With a natural weeping habit the foliage itself is green, turning to a contrasting red in winter. Winter is also flowering time and the flowers are small, a red to brown colour followed by interesting seed capsules. Used as a feature tree in gardens and parks Allocasuarina torulosa is also suited for use as a street tree and screening plant. 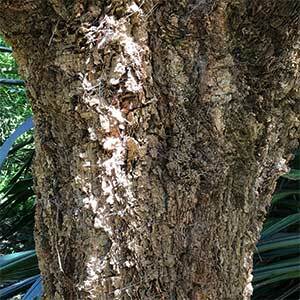 This is a spreading tree with a natural weeping or pendulous habit and with interesting fissured bark as well as attractive foliage makes a good garden tree. 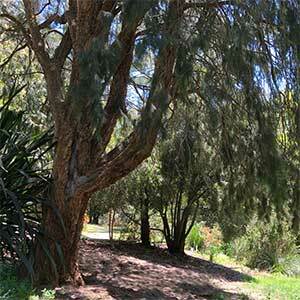 Originally from the coastal forest areas of Queensland to New South Wales, this is an adaptable tree and good examples can be found in the Dandenong Ranges in Victoria. Being a very easy care tree once established, this is also a tree that copes well with coastal conditions, and tolerates urban positions where pollution is high. It is reasonably easy growing and will need adequate space to spread into. As with most Allocasuarina varieties, not much will grow directly beneath the canopy. Usually grown from seed and germination is easy. Common Name – Rose She-oak, Forest She-oak. Soil – Well drained, will cope with a range of soils including poor sandy soils. Height – To 10 metres often less in poorer soils. Foliage – Green and needle like turning to a rusty brown/red in winter.